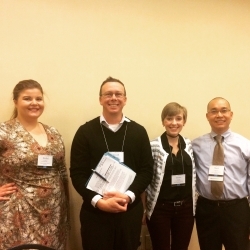 Noel Studio Consultants and Honors students, Jessica Vaught and Rachel Lachut, presented their research on metacognition in the Honors program at the recent National Collegiate Honors Council conference, held in Seattle, WA, along with faculty members Dr. Russell Carpenter and Minh Nguyen. Their research uses the Student Learning Inventory, developed by Drs. Charlie Sweet, Hal Blythe, Bill Phillips, and Russell Carpenter, to examine study practices among Honors students. The presentation, entitled, “How Do I Know? : Using Metacognition within the Honors Program” provided an overview of the results of this study along with a discussion of metacognition strategies and potential benefits to student learners. Their research is mentored by Dr. Russell Carpenter, Executive Director of the Noel Studio and Associate Professor of English.